Friends often ask me to recommend a book that will introduce them to the world of ITIL. And to set the scene right, they are not interested in ITIL Foundation, as they just would like to understand what ITIL is all about. Recently, I had to deal with employees, which quite quickly had to convey knowledge of ITIL, at least the main topics. Of course, there is a lot available online: blogs, videos, training, paid and free. But most of them are designed for people with experience in ITI, or in process management. Note, Books are judged on a scale of one to five, with one being the worst, five the best. Reading this book is wasting your time. The author does not explain even basic concepts; e.g. ‘IT service’. It is full of errors even in the names of processes (actually, most of the books fall poorly, I do not understand why it’s just the easiest thing to verify it with ITIL v3 official publications). It was really difficult to recognize ITIL while reading the book (maybe it concerns some specific implementation of ITIL processes?). The book is intended rather for people with IT background, not for someone new in the world of IT services. In my opinion, a waste of time. I will be merciful and will not give any marks. When I started with this book, I asked myself whether it was written on the basis of ITIL version second or third (this is my reservation not only to the book but several others in this review). Again the book is intended for people who know the IT and understand the basic concepts of IT Service Management. This is not a book for beginners, more for those who need to quickly remind what ITIL is about. The good is that the book includes some examples (not too much), which, although they are fairly general, however, facilitate the understanding of the presented topic. What was odd is the fact that, the book’s end with Service Transition (although the last chapter is called the Service Transition + Service Operation), but there are no described processes from ITIL Service Operation, and it lacks a part about Continual Service Improvement. To sum up: Poorly., But better than the previous position. The book has an arrangement typical for the books presented here (but it’s still nothing wrong), that is: – an introduction and the next chapters of the book are the subsequent phases of Service lifecycle according to ITILB with appropriate processes. ’Level Management’ instead of ‘Service Level Management’. The Service Design chapter lacks Continuity, Capacity, Security Management. Availability Management very neglect (3 lines). There is nothing about testing the Service Transition chapter. When the problem management process is described, basics about problems and incidents were not mentioned. I met some strange metaphors in the book, and I don’t buy all of the ways explaining ITIL. The big plus for trying to explain the ITIL and IT service management in simple words. The book does not explain what the service is, but most of the other important ITIL concepts have been explained. I give the book 2.5 (on a scale of five). It is the first of the books that I could convey to read a person who had nothing to do with ITIL; though I would have to also make a lot of objections. It seems that the author should explore certain topics because I managed to finish the book in 15 minutes (and I’m not a native speaker as for English). The first of the reviewed books, which can be regarded as mostly correct in terms of names used, though, minor mishaps happened (identity management rather than access management) and sometimes too far-reaching simplifications. The part about Service Asset Management process in Service Operations was a little strange for me and reminded me more ITIL v2, also some of the vocabularies come from ITIL v2, even though the author specifically mentions that ITIL version 3, 2011 is in use in this particular publication. The language of the book is a little more formal but still understandable, the book can be accused of using not enough examples as it is sold as a book for beginners. It is also not a book aimed at people starting work in IT, or having no basis in the area of service management. The book goes a little beyond ITIL and mentions other frameworks, also provides information on certification organizations associated with tools supporting ITIL processes (although everything very casually, but it is understandable if we have to become ITIL masters in one hour). The chapter on ITIL criticism is very sketchy and seems to be out of date, as ITIL is now mostly criticized for a lack of flexibility and incompatible philosophically (though not formal) with DevOps approach. I rate this book 3. The author suggests that the book is meant for businessmen, whom ITIL will help in their work. The first book, which explains the concept of ‘IT services’, with a nice example. As for naming, there are minor glitches, but the book holds rather proper names, with few exceptions. When it comes to detailed descriptions of the various phases of the service lifecycle, serious derogation from ITIL can be spotted- e.g. Compliance Management, Architecture Management (they exist but have not been distinguished as separate processes in ITIL). The book is written quite plainly, and pretty good fulfills its task. Especially at the beginning, where you can find cool examples, then they are no longer continued. I give this book 4. I think, it is the longest of the books reviewed here. The Introduction chapter promises that the entire will be very interesting, the example of a post company also appears to be an interesting analogy. But this is only begging for the book. Some definitions provided by the book are questionable e.g.- database, network – shown as an ITIL functions listed next to the Service Desk? The book also says about ‘ITIL Complementary Guidance’, which, in practice, are not on the market. There are also some inconsistencies that need to be forgiven because they result rather from simplifications – e.g. In the process of Business Relationship Management, there are mentioned six sub-processes, when they should rather be described as activities because it is more a collection of various actions and tasks. However, one has to admit, that the publication clearly reflects the meaning of basic concepts such as a ‘service’. On the plus side, you will be able to find here KPIs for almost each process although, I was surprised that ‘There are no KPIs used to evaluate the Design Coordination Process’ (interestingly, as this only applies to the process, similar discussion is also for other processes, e.g. Change management’s KPIs focused heavily on quantitative approach) – looking into official ITIL will give you easily much more examples. When reading this book one should be careful, when it comes to terminology used, in particular, the names of individual actions or sub-processes – they deviate from the official terminology of ITIL. I had an impression that I was dealing with a description of the specific implementation of ITIL in an organization, and not the ITIL framework. After the first chapters, I expected that it will be a lot of great examples in later chapters, actually, I have not found them. At the end of the book there are two big cases, but more showing the approach to the ‘implementation’ of ITIL and high-level business benefits than explaining the basics of ITIL. This book also deserves 4, the later chapters disappointed me (no examples), and if had not had good introductory chapters, the rating would be lower. However, I must admit that the book enables a pretty good understanding of what ITIL is about. The book practically distances itself from the IT and treats ITIL as a framework to conduct any business. The book has a lot of cool examples and ideas, interestingly the only one, that virtually had serious problems with the correct ITIL nomenclature. However, the transition from the world of IT to the business world (especially the restaurant case given) resulted in that part of the processes reassembles ITIL by name: service continuity management, evaluation, event management (taken literally as managing of events, e.g. parties), request fulfillment (where rather the analogy would be straight in the business world), operations management (taken literally) – where the analogy completely does not correspond to the IT process. After all, this is a book for beginners and probably because it has no appeals to IT, with appropriate commentary I would recommend it to someone who would like to learn a little about ITIL, and are not necessarily into IT. Despite a few mishaps, I give this book a good 4. In summary, I have not found the book perfect for beginners, yet. (Maybe it’s time to write my own?). The closest to what I was looking for was the last reviewed book (I read books in a random order, and somehow came out that the latter proved to be better). I was disappointed in the books that had an issue with using correct ITIL terminology, especially when ITIL should be IT’s lingua franca. 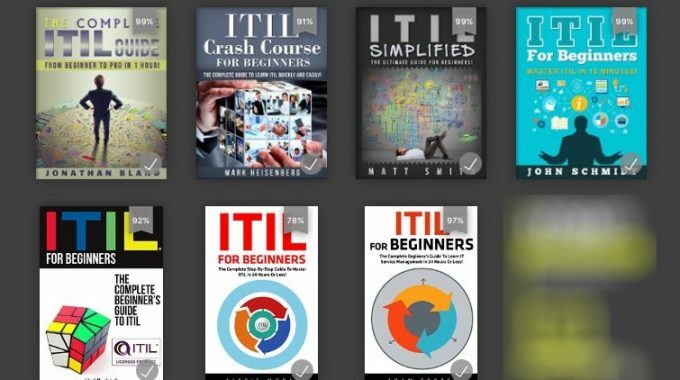 Do you know any other books on ITIL/ management of IT services, which could you recommend to your colleagues, that are new to ITIL?